Since Justin and I love all things peanut butter, banana and chocolate it was no surprise that I would make a granola that included all of the above. Justin wasn't overly excited about this granola at first, that is until he realized that there was chocolate & bananas mixed into the peanut butter granola- totally awesome. 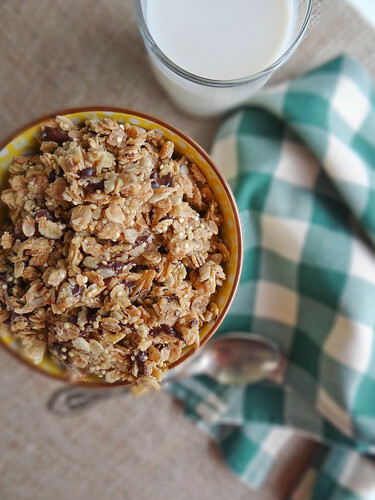 A batch of granola typically lasts us the week - this granola lasted a total of 3 days. Seriously, I was finding any excuse to go into the kitchen just to grab a handful to shovel in my mouth snack on and Justin couldn't help but to eat bowl fulls every morning for breakfast. 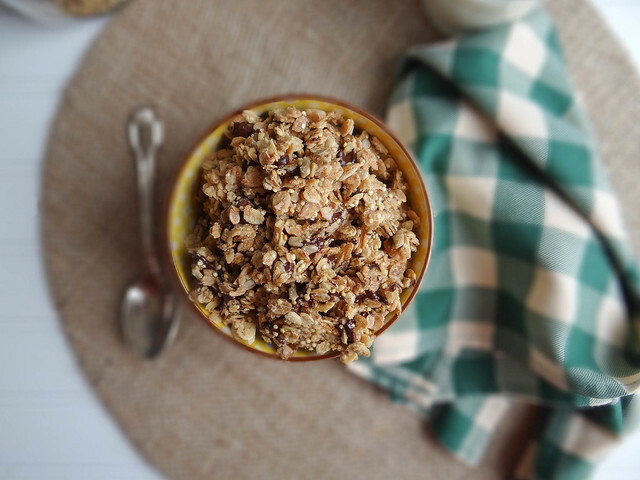 So do yourself a favor and make this granola at least once in your life - it will be a decision you won't regret. Trust me on this - it is a granola game changer. 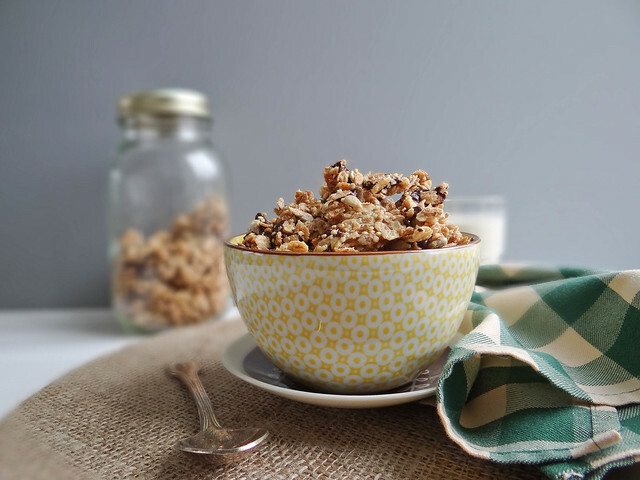 Do you have tried and trusted granola recipe? In a small sauce pan over medium heat combine peanut butter, maple syrup & coconut oil - heat until peanut butter & coconut oil has melted. Combine oats through quinoa in a medium mixing bowl, toss to combine. Pour Peanut butter mixture over the dry ingredients and stir until all dry ingredients are well coated with peanut butter mixture. Line a rimmed baking sheet with parchment paper. Spread granola mixture evenly onto the baking pan. Bake for 35 minutes, stopping to stir the granola at the 20 minute mark. Remove granola from oven, while the granola is hot from the oven press the granola firmly down into the pan with the back of a spatula. 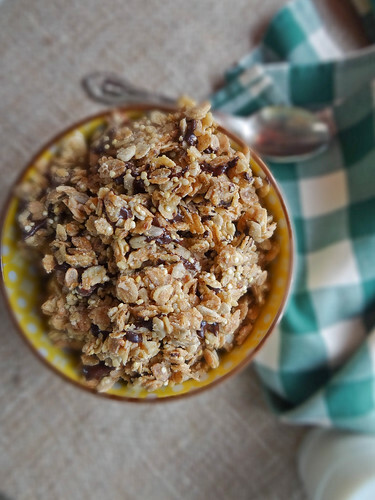 Sprinkle the dark chocolate chips over the warm granola - allow to fully cool on the baking sheet. 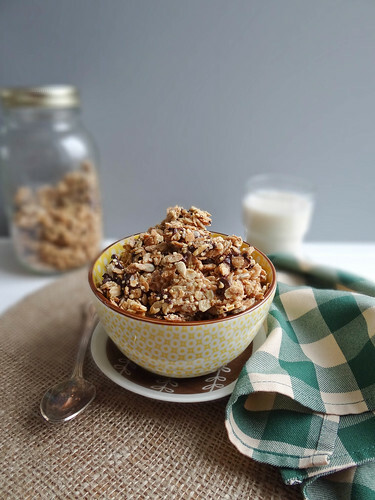 When the chocolate chips are still warm I like to stir up the granola which forms chocolate chunks of granola - allow the chocolate to firm up prior to storing in an air tight container - I like to use a mason jar but any container will work. Is the quinoa cooked first or just mixed in raw? peanut butter, banana, and chocolate are the perfect combo. this must be the best breakfast ever in a bowl covered with vanilla almond milk. love the addition of quinoa! 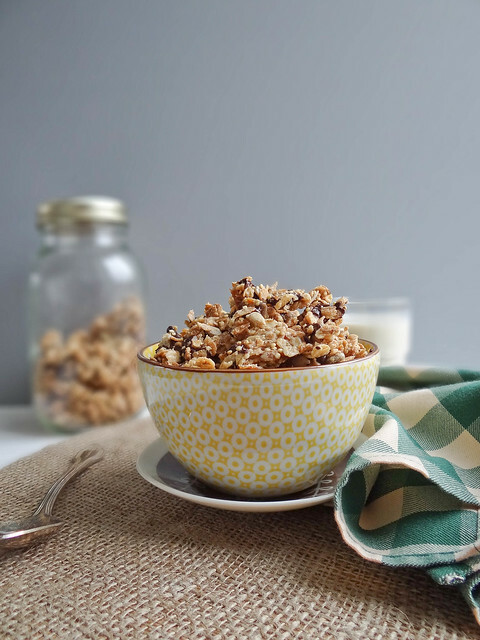 Ooh, that looks amazing, and so much simpler than most granola recipes!!! Arrested Development is mine and Chris's favorite show. Seriously. We don't watch TV, but we will watch this on an endless loop. We're the dorks that quote it to each other all day. Yup. We're those dorks. But isn't it the best show? Are you loving it? Arrested Development is brilliant! :) One of my fav shows! I also love Curb Your Enthusiasm and Always Sunny in Philadelphia. Those 3 shows make me laugh so much! This sounds delicious. 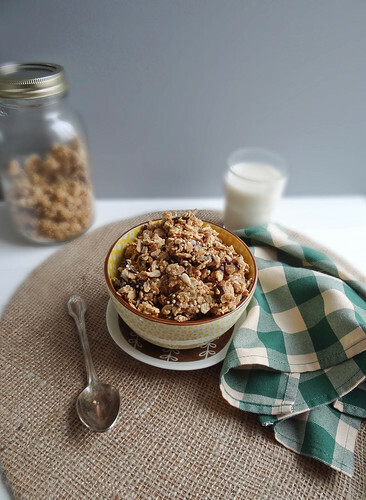 I have been on a serious oatmeal kick, but I have a feeling I will get back into the granola routine as soon as it starts to get warmer out again. 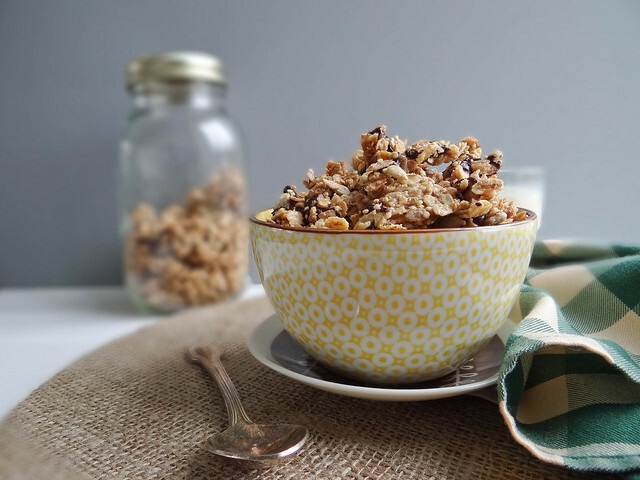 Wonderful granola- flavour combos don't really get much more perfect do they?? 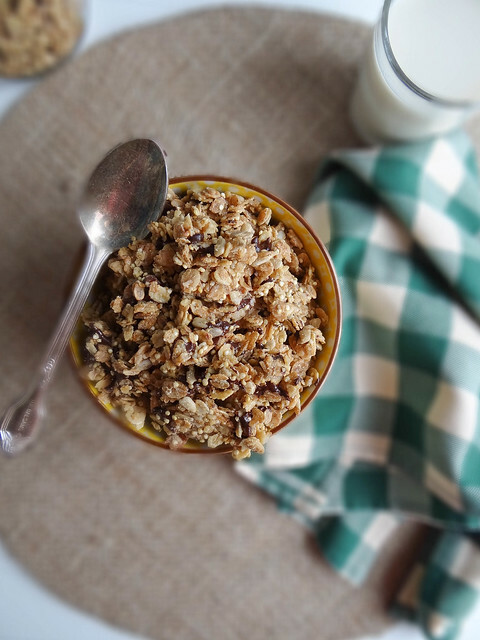 A peanut butter inspired granola sounds like a dream come true. Thanks for sharing your version. Hi. Sounds delicious! I'm not one to follow recipes exactly, so wanted to get your advice on some substitutions. What would I use instead of the maple syrup? And how can I dry fresh bananas to use for this recipe? Or can I somehow use fresh bananas? Usually when you buy dried fruit, they always add a ton of sugar and other stuff to it so I try to avoid it. Thanks! Hi! You could use agave or honey in place of the maple syrup // I wouldn't use fresh banana in this recipe and there are plenty of recipes online on how to dry bananas using a food dehydrator or oven method- I would just google that to get the correct instructions. Thinly slicing the banana and then baking on a lined sheet at the lowest possible oven temp usually does the trick! I have baked them @ 170 degrees for about 45 minutes.